This deluxe version of the royal treatment includes everything from the large royal treatment: fizzing mineral bath that with a soothing pomegranate fragrance muscle relaxant water softener and a skin softener pomegranate bath gel with rich moisturizing foam that makes it wonderful to use as shower gel and a gentle shampoo pomegranate bath and body scrub with natural hydrating oils pomegranate therapy body lotion with vitamin rich all-natural moisturizing treatment for the hands pomegranate body butter gel based eye mask that offers treatment to tired and puffy eyes and will help to rejuvenate or relax her when it's either cooled or warmed exfoliating gloves loofah cleansing mitt loofah and terry back strap for those hard to reach places terry bath pillow with suction cups to secure it in place for a truly relaxing bathing experience beautiful scented candle wooden hair brush loofah and terry bath slippers hardwood manicure groomer hardwood pedicure groomer wooden back roller for massaging aching muscles hardwood soap dish beautiful ceramic photo frame with elegant rose design plus: calming foot soak soothing "serenity spa" cd beautifully packaged and delicious "simple pleasures" gourmet cookies decaf French vanilla chi tea raspberry truffle coffee Belgian chocolates in the deluxe version of this gift basket we replace the wooden back roller with a more impressive wooden massager. Her royal treatment is complete with beautiful silk flowers and silk ribbon. This is one very large and very wonderful gift basket that will make her feel like a queen. 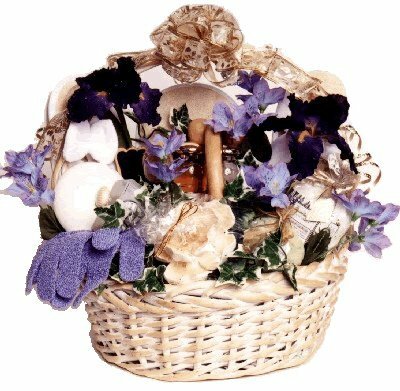 This is an exceptional gift basket that will make a grand impression and provide her with soothing relaxation for the mind, body and soul.